The reason for extracting a tooth may be all too obvious — the tooth is too decayed or damaged to attempt saving. The reason for extracting a wisdom tooth, on the other hand, may not be so apparent: from the perspective of pain or reduced function, you may not notice a thing. Our recommendation to remove a wisdom tooth is based primarily on what may be occurring out of view below the gum line and its potential threat to adjacent teeth. Teeth grow and develop below the gum line in the jaw, and then push their way through the gums as they appear in the mouth (eruption). After a normal eruption, the enamel-covered crown is visible above the gum line; the remaining tooth root (about two-thirds of the tooth’s length) resides below the gum line. Because wisdom teeth, or third molars, erupt rather late between ages 17 and 25, they may lack the room to erupt properly due to crowding from other teeth that have already erupted. This can cause the wisdom tooth not to erupt fully through the gums, leaving the crown trapped below the gum line, a condition known as impaction. For the tooth, impaction increases the chances of infection, cyst formation and gum disease around it. 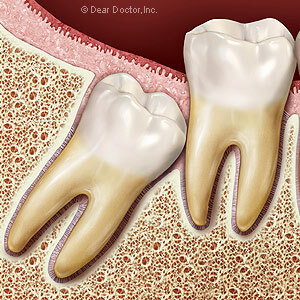 An impacted wisdom tooth can also cause problems for the adjacent teeth as well. The impacted tooth may begin to press against the roots of other teeth; the resulting pressure can damage the other roots, increasing the risk for disease or future tooth loss. A person may not even know they have this problem since there’s often little to no noticeable pain or symptoms. It may seem counterintuitive, but the best time to remove a wisdom tooth is when it’s not causing immediate problems. There will be, however, signs found during examination (particularly x-rays or CT scan) that future problems are in the making. By extracting an impacted wisdom tooth at the appropriate time, we can avoid more serious problems in the future and improve oral health.